So, by now you're probably used to seeing lots of my personal work, sketches, or newly released published work online. But I realised, as 2016 draws to a close, I rarely showcase a lot of the work I do behind the scenes for more corporate clients - but this year has been full of work for local schools, festivals, and national business events, that I thought it'd be worth sharing a few of my favourite pieces! 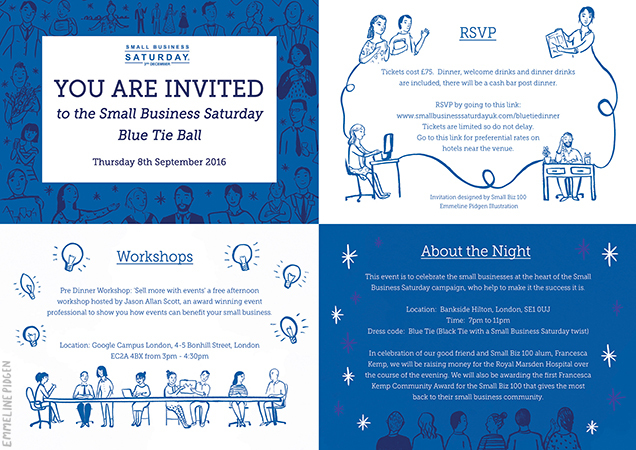 This very blue themed invitation was created for Small Business Saturday's Blue Tie Ball (does the theme make sense now? ), who commissioned me after seeing my small business themed illustrations for last year's Small Business Saturday. It was a really lovely project, where I had a lot of scope to spend time drawing amazing small businesses and freelancers, and keep everything simple with pure linework. The ball itself in London was amazing, full of glamorous business leaders and a delicious meal - and it was brilliant to see my illustration work used across all the media for the evening. I love working for local companies and events, so it's been a great year for building connections around Manchester and Lancashire. 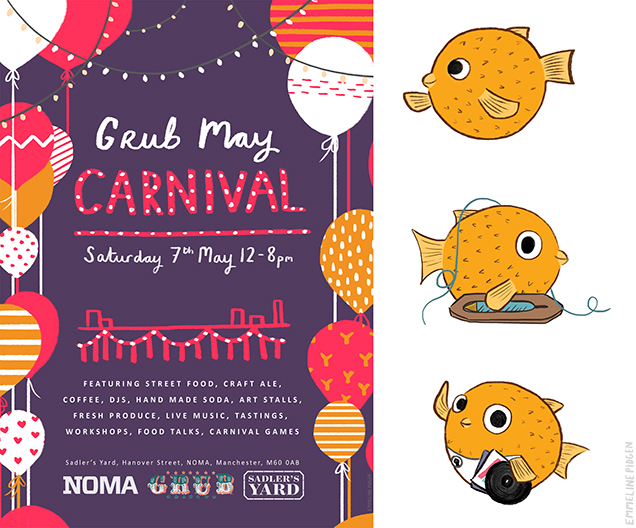 I had a really lovely few commissions for Cheadle Hulme School (at the top of this post), for their brochures and presentations; as well as this poster for the incredible Grub Food Festival's May event and these (slightly silly, but loveable!) pufferfish illustrations for the Museum of Wigan Life's children's trail. 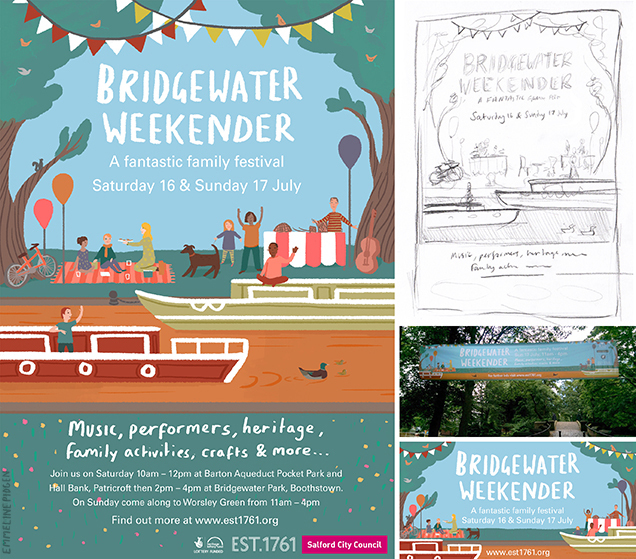 I was also commissioned by Salford City Council to illustrate a poster and social media campaign image for their annual Bridgewater Weekender Festival over Summer. This was such a fun one, just look at all those happy people! I loved being challenged with a bit of problem solving in following EST.1761's strict brand colours for the illustration (which were actually not that far off my usual palette! ), and it was so interesting to delve into the history of the Bridgwater canal. That's one thing I love about local commissions, they always spring open so many opportunities to learn new things about the area, and meet so many incredible and creative people! Here's to more in 2017.